Can you believe “Weird Al” Yankovic has been parodying popular music for 33 years now? It’s a testament to his talents as a musician and songwriter that he’s still around all these years later, and if you’re as big a fan of “Weird Al” now as you were in the ‘80s, a new box set of all his albums—including some new tracks—is arriving this November. Squeeze Box: The Complete Works of “Weird Al” Yankovic, from Legacy Recordings, not only includes all 14 of Yankovic’s official studio albums, but it will also come with an additional album featuring previously unreleased non-album tracks, and a 100-page book chronicling the musician’s career. 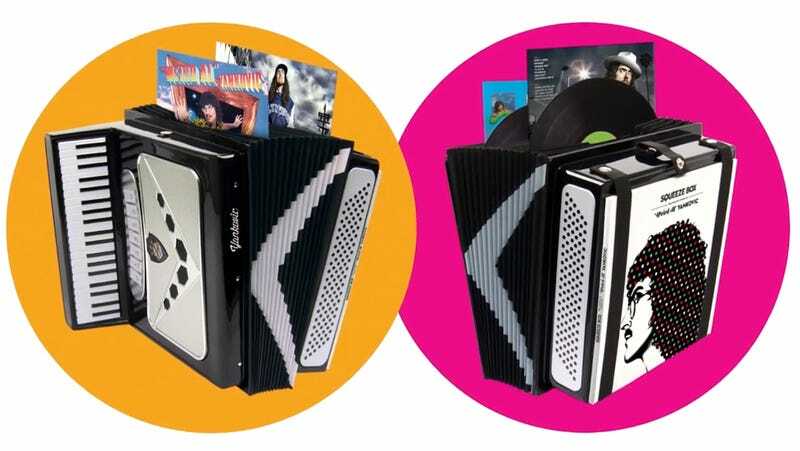 If that’s not enough, the box set is also packaged in an exact replica of “Weird Al”’s accordion, which isn’t playable, much to the delight of your roommates. Available for pre-order now over on PledgeMusic, the priciest version of the Squeeze Box set is $475, but comes with all of his albums pressed on vinyl, and a few other exclusive accessories. If you prefer CDs, you can instead opt for the cheapest version of Al’s complete works, but that will still set you back $200 when the Squeeze Box sets are available starting on November 24, later this year. However, if you fancy yourself Yankovic’s biggest fan, you can even drop $1,500 on a “test pressing” set featuring all of his albums on vinyl, but each one will arrive signed and numbered by “Weird Al” himself. Only 27 copies will be made available, ensuring it’s instantly a rather rare collectible.